What a volatile end of the year December was. 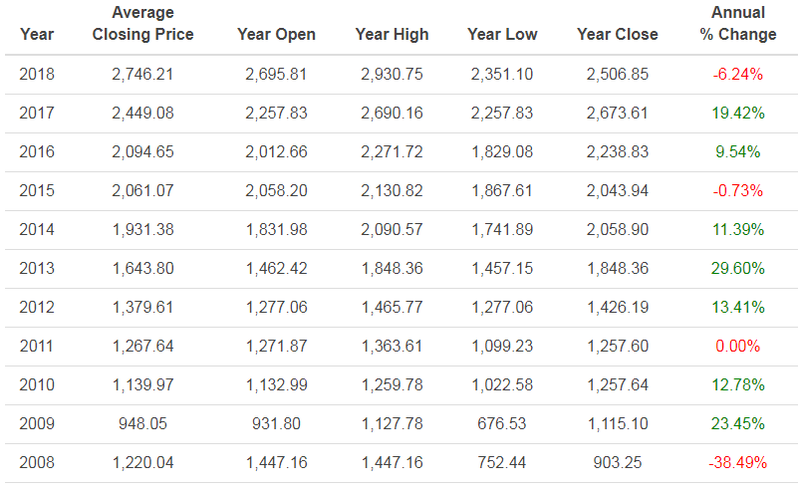 Here's a screenshot of past yearly returns for the S&P500 and how this year compares. After the market closed on the final day of 2018, my portfolio sits at $570,687 with the stock position I hold averaging a 3.01% yield. Right now the portfolio outputs $16,481 in future annual income. The cash position now sits at $15,895 or 2.79% of weighting. I will post a full summary in a report soon after the holidays. Happy new years to everyone. Let's make 2019 a good year and increase the dividend income even further! The S&P500 has pulled back around 13% from its highs. For those that only focus on price, 2018 has not been a good year. My portfolio has pulled back from the $600K levels and is now sitting in the high $500k's :( I made a vow to myself that I will climb myself back up! The lower prices a lot of companies are dropping by is creating a lot of good value. Each share I can purchase now contributes more dividend income compared to when the S&P500 was at its peak. Although this site says my goal is to reach $1MM by some time, the real goal of the portfolio is income appreciation. Since I am still in my accumulation stage in life, I want my dollars to be put to their best use. A market sale provides are more efficient way for me to deploy cash as yields will be higher. I am developing a list of stocks I am planning to purchase after the holiday season. I do not expect to purchase anything from now until the end of the year as I will be going on vacation. After New Years I plan to have around $15,000 in capital around mid January. Hopefully values are still attractive by then. My feeling is that since the S&P500 is ending the year quite negative, tax loss harvesting is going to exacerbate a lot of the losses. I do not plan to tax loss harvest as I do not like selling any stock. February is traditionally a bad month as well. And since the trend now is downward without any recovery, I am feeling rather patient waiting for a floor of resistance before deploying anything quickly. This may mean waiting in January or waiting until February. 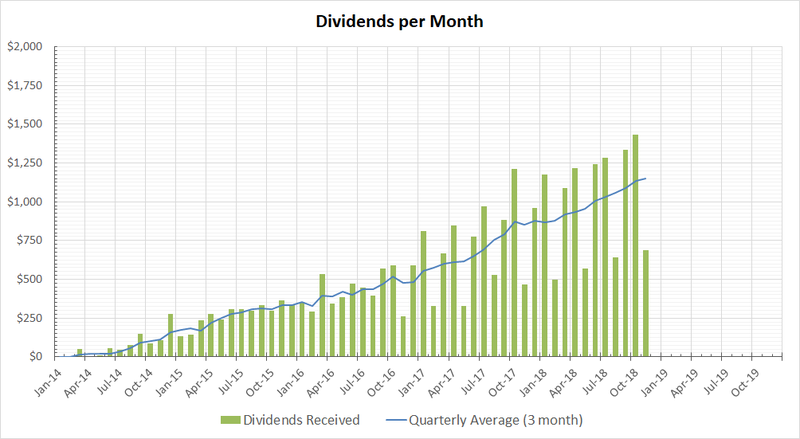 After my recent large purchase a few weeks ago, my portfolio has had a large swing upward in dividend income so I do not feel a need to increase it as quickly in the interim. My focus is on defensive type businesses with conservative yields and conservative payout ratios. There are discussion about recessions and slowdowns. A defensive portfolio with business types that still function very well under larger unemployment will preserve capital and pay dividends better than cyclical industries like oil & gas, industrials, transports, banks, and discretionary. Defensive industries include sectors like consumer staples, healthcare, and utilities. Eventually stocks will fall hard enough during hard times and the dividend yield will be the only thing keeping a stock from falling any further. The yield acts as a floor. If JNJ or Clorox falls in price to a 4% yield, then that will be a huge bargain as those payout ratios are safe and the business is defensive in nature. When a stock like Netflix or Tesla falls 60% there is no dividend to pay you to hold along, there is no floor of protection. The only thing keeping you in is the prospect or hope that the price will rise back up again. I don't believe I can invest in a business just based purely on price speculation, hope that the price will go up one day. I need to have some form of payment periodically to allow me to hold it comfortably during a recession. The dividend is reassurance to me that the business is still profitable and that I can still rely on it to provide income even during bad economic times. Dividend aristocrats are examples of companies that have survived countless recessions while still maintaining a increasing dividend year after year, these companies RAISED their dividends during recessions. This is why my portfolio is heavily concentrated towards dividend aristocrat types of businesses that are in defensive sectors. Dividends don't lie and at the end of the day if a company is cash flow negative, there will be no dividends. The market has been volatile recently. It has been range bound for several weeks primarily on fears of the escalating trade war with China and the slight slow down of the American economy. There rae discussions about the rise in interest rates slowing things down, and talk about how the boost from this year's tax cut will not be so evident next year. The S&P500 looks like it's testing its lows again. Dollar is relatively strong. And oil is very cheap, appearing to bottom at around $50. Overall things look quite unpredictable right now in terms of where the index will head. There are too many outside variables that happen on the news day to day. For example, the American government arrested the CFO of Huawei today in Vancouver for violating Iranian sanctions. This increased uncertainty due to escalating tensions between China and the US. This type of event happened with Chinese ZTE in the past and it did not help the market calm down. Since it is impossible for me to predict the market, my objective is very simple. Acquire high quality companies that pay dividends with very safe payout ratios. For every dollar that I earn from my vocation, I save a good percentage and allocate them to income producing stock. I don't time the market but instead deploy capital periodically (i.e. every 2 weeks to every month). The graph I focus most on is the growth of the forward annual dividends my portfolio will generate, not the net worth of my portfolio. I expect the net worth of my portfolio to climb steadily over time as the shares I own will continuously increase their dividend year after year. Net worth is secondary to income growth. If an asset generates more income, the more valuable it will become. Additionally, any dividend income I get I reallocate back into the stocks that paid them. Since I am young and in the accumulation stage of my life, my goal is to collect as many shares as possible and then let the shares compound on their own. I expect each of the shares I purchase will be able to increase their dividend year after year, further amplifying the income compounding effect. I decided to deploy around $44,000 across my various positions today. I could of bought a nice car or down-payment for a house but I decided to plop it in income investments. This is a large purchase for me and will boost my dividend income quite noticeably. It is hard for me to time the market. I do not foresee needing this cash in the next year and my vocational income comes in every 2 weeks. My emergency cash fund is sufficient for my low expense lifestyle and the dividend income now per month is large enough to pay for a lot of random things if needed. So I decided to deploy it sooner than later as I am focusing on increasing my passive income. I sprayed it across basically all my positions.